H, there! Michael and I are having a few days of fun in Las Vegas! Follow us on Instagram (WEEKENDGOURMET) and Twitter (@TheWeekendGourm) to see all of our fun in real time! We'll be eating lots of great food and seeing some great shows...so don't miss the fun! 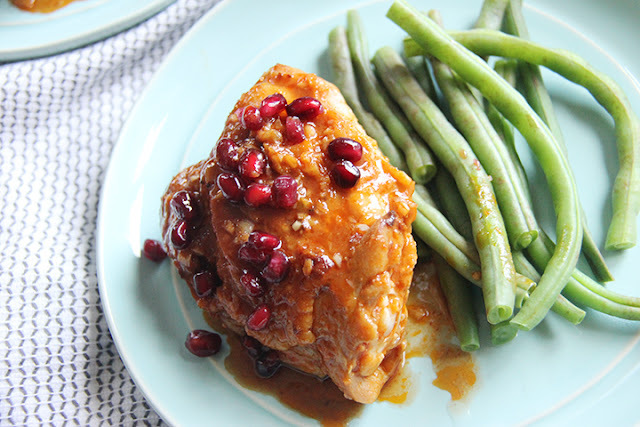 While I'm gone, my talented friend Linda from Brunch with Joy is sharing a fabulous chicken recipe today. My mouth is watering -- and I can't wait to try this recipe out soon! Hello friends! My name is Linda, and I blog over Brunch with Joy, a blog about modern classics homemade adventures. Thanks to Wendy, because I get a chance to meet Wendy's lovely readers today. I hope you like spicy food, because I have this spicy roasted chicken to share. First things first...spicy food + pomegranate doesn't even make sense, you say. But it most definitely does. I've been thinking about this post since early of this week. I drafted this post with very non-descript name, thinking I would change it when I was about to publish it, but my brain is...taking a break. So here are my thoughts. It's been a long day at work and you're hungry (with a capital H), and the dark night absorbs your energy ten times than any other nights. You are not inspired to cook, not even after browsing your Pinterest board -- and driving to the grocery store is a distant dream at this point. Like many of you, I always crave for homemade comfort food on days like that...something that is lickity-your-lips-good. Well, I found a solution for you: spicy roasted chicken that will make your mouth dance. Step 1: Rub chicken breasts with oil and sprinkle both sides with salt. Heat oil in a 12″ cast-iron or heavy skillet over high heat until hot, but not smoking. Arrange chicken in skillet, skin side down, and cook for 2 minutes. Step 2: Reduce heat to medium-high; continue cooking skin side down, until skin is golden brown, about 12 minutes. Combine the rest of the ingredients, except pomegranate and salt. Put chicken in a bowl and turn mixture several times to coat. Let marinate for at least 30 minutes at room temperature, but preferably overnight in the refrigerator. covered for 5 minutes and garnished with pomegranate before serving. This simple dinner has rockin' flavor that will turn your blah night into an a-ha night with a disco ball in the background. 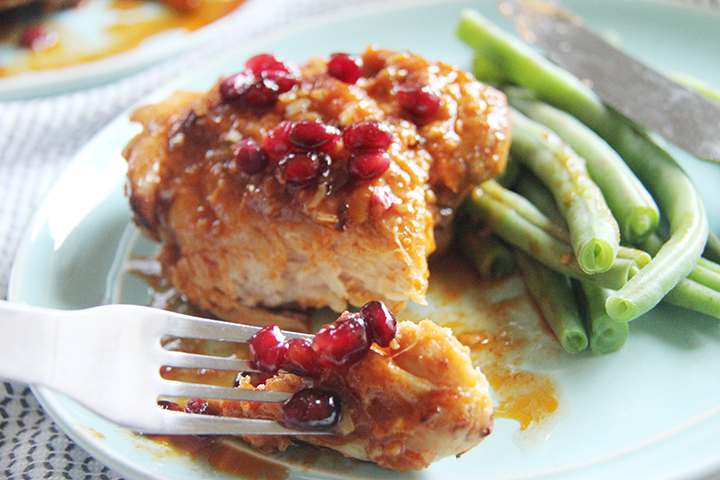 I love the combination of spicy and sweet, with extra crunch from pomegranate -- and the hubs also approved this recipe. I hope you get a chance to make this, and feel free to stop by and let's be friends on Facebook, Twitter, Instagram, and Pinterest!